Click donate at the bottom of the page to donate online! The Friends of the Bellingham Public Library group is a 501(c)(3) charitable organization created to help support the Bellingham Public Library. All donations are welcome! The Library Trustees and Friends of the Library are collaborating on a project to obtain a life-size bronze statute of Indy! We have commissioned Lena Tortich of the Young Fine Art Studio, Salt Lake City, UT. You can see her work here. The project will cost $5000 and the Library Trustees have made the initial $1000 deposit. We need your help to raise the additional $4000 needed to bring Indy back to the children of Bellingham. This project is to honor Indy, our Tail Waggin’ Tutors library reading dog, who gained his angel wings in late December. 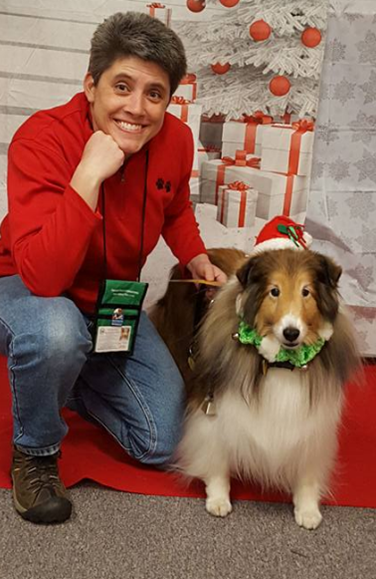 For more than 5 years, Leah Caracino, a Blackstone resident, brought Indy, a beautiful Sheltie, to the library to be read to by children of all ages. One small bark on Monday night and we all knew Indy was here! The Tail Waggin’ Tutors program provides a relaxed and “dog-friendly” atmosphere, which allows children the opportunity to practice the skill of reading. Each week up to 4 children had Indy’s undivided attention for 15 minutes of reading. By sitting down next to a dog and reading to the dog, all threats of being judged are put aside. The child relaxes, pats the attentive dog, and focuses on the reading. Reading improves because the child is practicing the skill of reading, building self- esteem, and associating reading with something pleasant. Thank you Indy & Leah for all the hours of listening to my kids struggle to pronounce words as they learned how to read. We owe a good deal of their love of reading to your patience! We are so very sorry to hear this! Leah, you and Indy are loved and much appreciated. Thank you for encouraging my children to become readers. It's so hard to say goodbye to our furry family members! Indy was incredible and he (and you!) really helped my daughter gain confidence in reading when she was younger. Both kids LOVED to read to Indy! He'll be missed. So sorry to hear about Indy. We met him at the Polar Express Extravaganza and we could tell how truly special he was. Rest in peace Indy. I made an appointment for my not yet walking or talking 11 month old son who never met a dog. I asked so that my son Andrew could be introduced to a gentle dog. Leah was so kind, and my baby drank a bottle while I read him a story and he sat next to Indy and was able to pet him and even gently explore him. Leah, thank you for sharing him with us. He was a beautiful soul and all our beloved pets are there with him at the Rainbow Bridge. · Tax deductible donations can be made by clicking the DONATE button below! · Any coins or bills dropped in our Dino Bank for the next few months will be dedicated to the project. _____ Yes! I want to donate to bring a life-sized statue of Indy to the library! Providing your email address will enable us to send you an electronic donation receipt as well as put your name on a list of people to notify of the unveiling date of the statue, which will be in late summer or early fall of 2017. Thank you for your help in bringing the commemorative statue of Indy to the Bellingham Library.